Welcome to our Special Edition of Buddha Statues , a series of limited edition products, collector's items. Add variety to your selection by browsing through our range of other Buddha Idols. Click here to go to our Standard Buddha Statues .Collection (INR 10,000-50,000). Click here to visit our Budget Friendly Buddha Statues Gift Series (INR. 10,000 and above). Select an exclusive gift for your dear one ! Contact us for exclusive Buddha Retreat Programs ! Buddha Statues on Sale in Buddha Bazaar. SHAKYAMUNI BUDDHA GAO PIECE (WITH GREEN TARA AND VAJRA ON COVER). To picture the size of your Buddha Statues, Buddha Idols..refer to our *'how big is my statue..?' side column...! 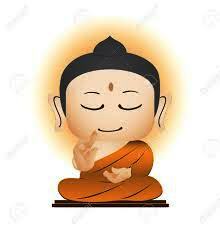 Gautam Siddartha Buddha was born in Lumbini in Nepal as a Hindu Prince. He attained Enlightenment under a Bodhi tree in Bodhgaya, India. His first sermon was in Sarnath near Varanasi, India. He attained Nirvana in Kushinagar, India. He gave the World the Philosophy of Buddhism, which spread far and wide. 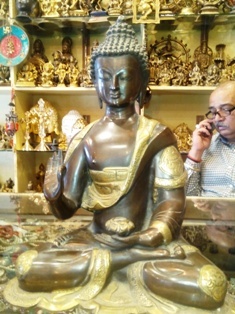 You can find all kinds of Buddha Idols and Statues in Buddha Bazaar, from cheap statues to exclusive, valuable Indian Art & Craft Collectibles.Along with Buddha Statues there are many other Buddhist deities available in the Buddha Bazaar store. Most of the Buddha Statues are hand cast and are unique in the vision of the artists in Dharamsala...Sakyamuni Buddha, Avalokiteshvara Buddha, Maitreya Buddha, Medicine Buddha, Laughing Buddha, Amitabha Buddha and the wise Vajrasattva Buddha, famous on the streets of Dharamshala Shopping, can be found in this Online Shop.You can complete your entire Buddha shrine while shopping here. Prayer Beads,Prayer Stupa,Incense Sticks,etc can be purchased on request. 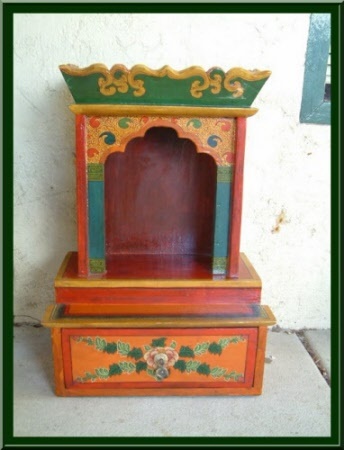 Complete your buddhist shrine here! A Buddha Bazaar must transcend a sale into a shrine, a purchase into a prayer and radiate spiritual energy into your daily cycle of life. It is important to know your Buddhas.. The central figure and the founder of Buddhism is Gautama Siddarth Buddha. He is the Universal Buddha representing the Power of an Enlightened Mind and the true Wisdom of a Compassionate Heart. Within Him lies the Energy of All the Bodhisattvas. Avalokiteshvara Buddha : The Buddha of Love and Compassion. Weeping/Sad Buddha : The Buddha statue expressing grief and shedding tears for the salvation of the Universe. 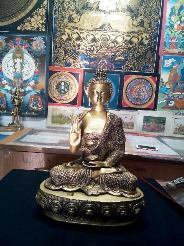 * The Buddha Statues on Sale which you buy can have the Holy Mantra Scroll blessed by a High Monk inserted inside the idol. It is believed this will bring High Spiritual Energy around you. 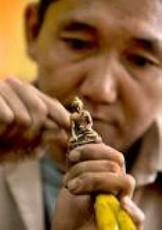 Statues of Buddha should be chosen with care. Click here to read more about your Buddha. * We accept All major International Credit Cards, Debit Cards, ATM , Bank Cards, Net Banking, Mobile Payment & Paytm. The Indian Rupee price, will be automatically converted in the currency of your card. * All prices are inclusive of Shipping Charges. * For a quick preview of the price in your local currency you can use the Currency Convertor given with each product on our Buddha Bazaar Online Shop or use it below ! * Our gift series of Ganesh Idols, Buddhist Statues & Hindu Gods n Goddesses are valuable, pocket savvy India Art n Craft products. * Other ranges : Standard Buddha Statues. * Special Edition one piece Buddha Statues & Gift Series. Links available on top of the page. Terms and Conditions...Click here !